A while ago, Friedrich Weinmann, a frequent feature requester and current SAPIEN MVP, put in a request for a Public Wish List. Initially, we thought we didn’t really need that because we have a Wish List and Feature Requests forum. However, after some consideration, we realized Fred had some very valid points. In Fred’s words, we wanted to “to give more transparency and access feedback from a larger segment of users” So it is with great pleasure that we unveil our new public Feature Request web application. We know it is currently very basic, but we wanted to give our users the opportunity to start using it as soon as possible. The Feature Request application is visible to the public, but you must be a registered user and logged in to make, vote or comment on a request. 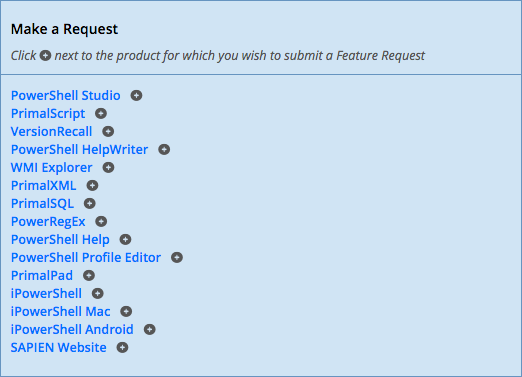 You’ll find the link to Feature Requests under our Support menu. The first thing you will see is the Feature Request Home page. 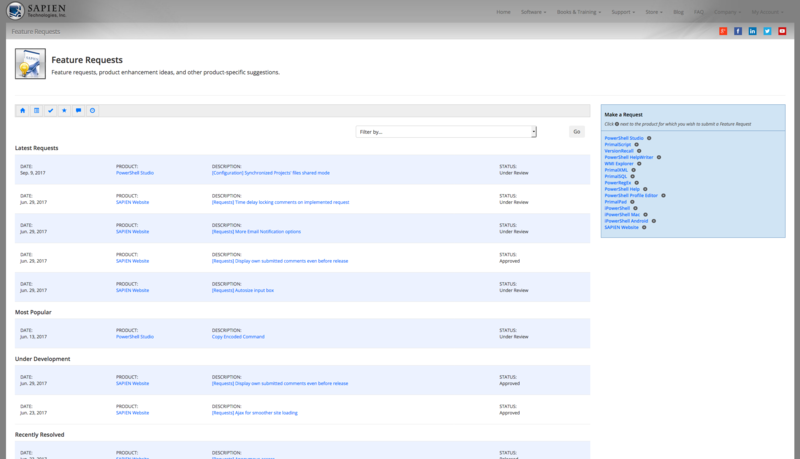 This view will show you at a glance the requests that are the most recent, the most popular, under development and recently resolved. From the small menu near the upper-left, you can always jump back to this view by clicking the Feature Requests Home button. 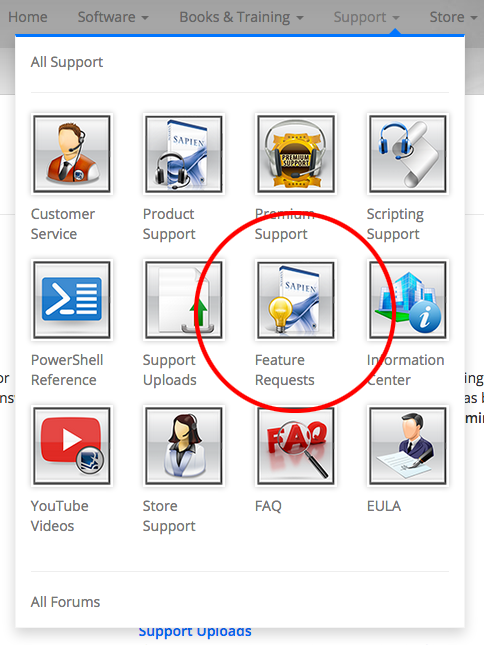 View your open requests by clicking the Open Requests button. See your resolved requests by clicking the Resolved Requests button. View the list of requests you have up-voted by clicking the Up-voted Requests button. 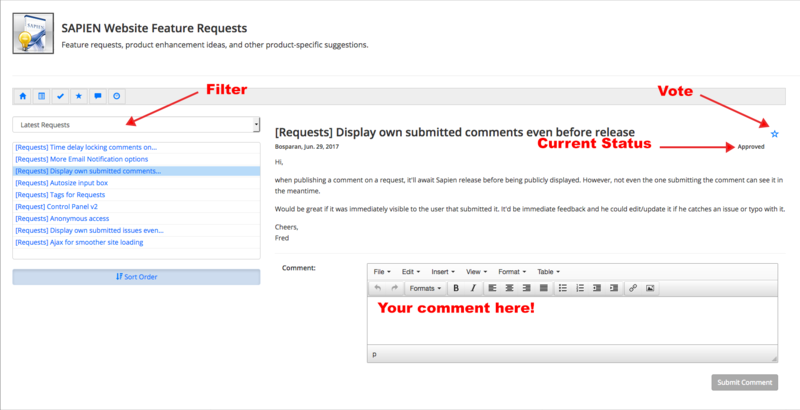 View the requests on which you have commented by clicking the Commented Requests button. Update your preferences by clicking the Update Preferences button. At the moment, your preference settings are very simple. We hope to expand on these in the future. You can modify your view of the Feature Request Home page to display only requests for a specific product, by choosing the product from the drop-down menu near the upper-right. 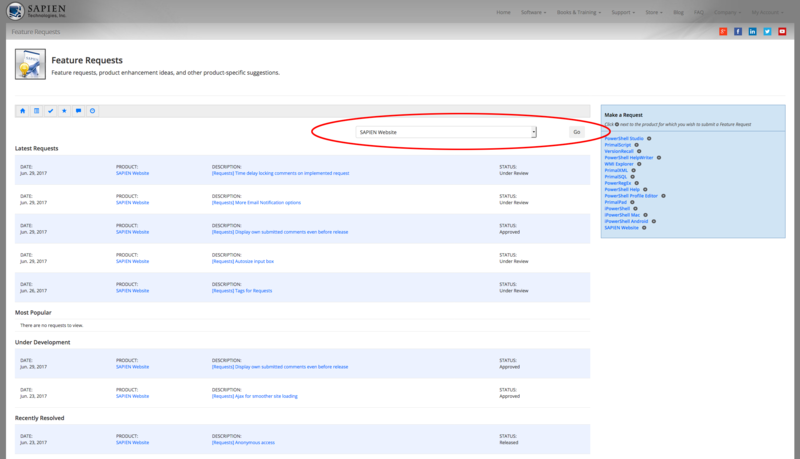 You can also view product specific feature requests by clicking on the product name in the request list or in the Make a Request toolbox on the right. Go straight to a specific request by clicking on it’s description in the request list. 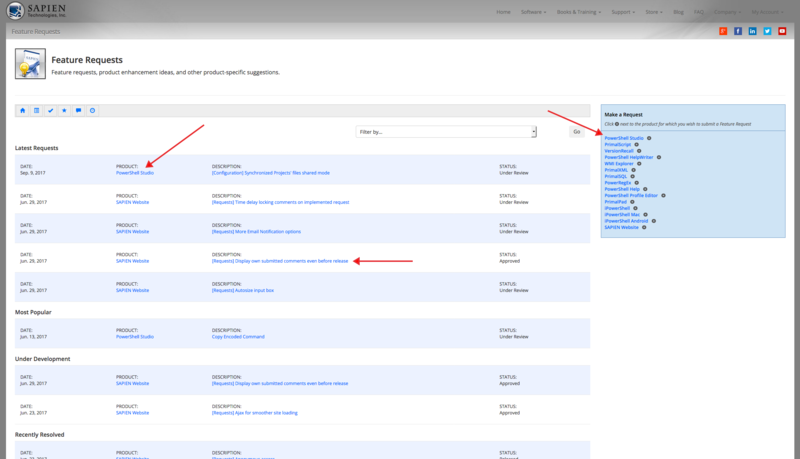 On the product specific page, you can filter request by latest, most popular, under development and resolved. Clicking on a request in the left-hand list will bring it up on screen. Up-vote a request by clicking on the star—once you vote for a request, the star will turn solid blue. The current status of a request is always visible just under the voting star. Possible statuses are: Pending (visible only to original poster and SAPIEN administrators), Under Review, Approved, Duplicate (with a link to the duplicate request), Denied (with a reason for denial) and Released (with a version number or date of release.) And, of course, you can comment on a request here as well. And last, but certainly, not least, to make a request click on the plus (+) next to the product for which you wish to make a request in the Make A Request toolbox on the right. In the resulting screen, enter a short description of your request and then a more detailed account of what you are looking for and why. We encourage you to include images and links. We want to make sure we understand your needs! When you are finished, click the Submit Request button. That’s it! We hope you will take advantage of this new application on our website and look forward to hearing from you! Join us in Orlando, FL at Microsoft Ignite 2017! I’m still showing “Support Downloads” in the tile that the screenshot shows the “Feature Request” app. Found a link to the app at the bottom of the web page. Click the “Home” page and the feature request tile appears. It seems to not appear on many menus. We had some caching issues that have been corrected. You should see the proper items in the menus now!